This product must be ordered in multiples of 2. 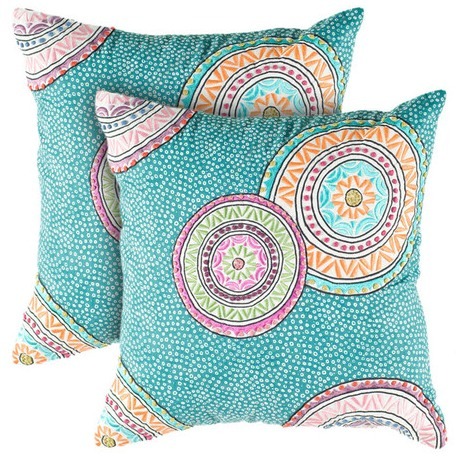 Whether composed as a colorful vignette or simply as an eye-catching statement piece, this beautifully crafted pillow adds a chic touch to your home décor. Cleaning and Care: Hand wash in cold water. Lay flat to dry. Add some texture to the setting with Dransfield & Ross® accent cushions in a bluestone, dark natural, and ice color palette. 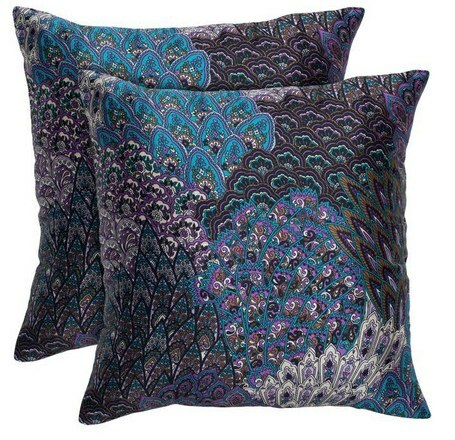 “Beauford” damask pillows are woven in the USA of rayon, polyester, and cotton. Pillow with mirror accents is linen/cotton. Imported. “Greek Key” pillow is made in the USA of imported linen. Ribbon-loop pillow is silk. Imported. Distinctively idiosyncratic with a couture edge, Dransfield & Ross home furnishings have an unmistakable style that stems from the creators’ backgrounds in fashion and high-end textile design. For 16 years, John Dransfield and Geoffrey Ross have developed an ever-evolving collection that they recently expanded to include furniture and decorative accessories for home, desk, and bath. They are based in New York City. 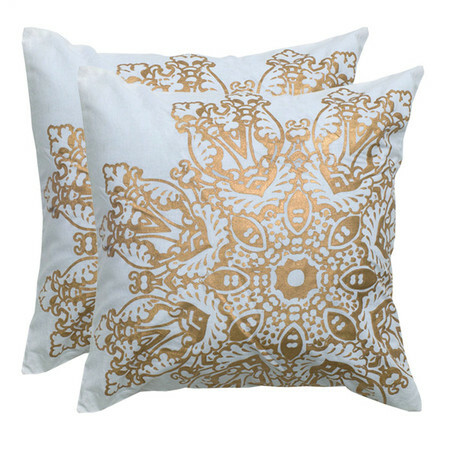 Stella cushion from Joss & Main. 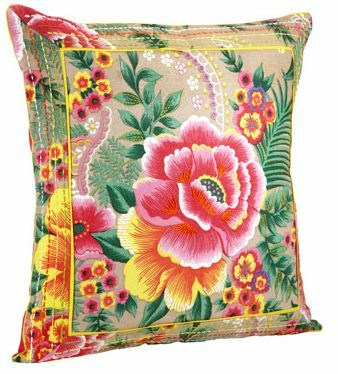 A Gorgeous fun floral cushion cover with intricate hand embroidery by womens cooperative SEWA. Monsoon is working with SEWA to help create livelihoods for artisans in India, all profit will be donated to the monsoon accessorize trust. Made in 100% cotton, and dimensions of 50.5 cm x 50.5 cm. What else can we say than this design will work in so many ways around your home. 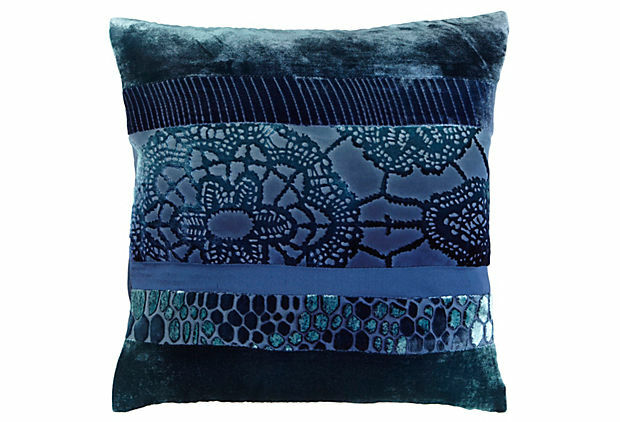 A luxury designer accent with an artisanal air, this pillow cushion is crafted in patchworked velvet with a range of textures and motifs, size 16 x 16 inches. Kevin O’Brien’s company mission is to make the world a better place, one inspired design at a time. Although he started out hand-painting, cutting, and sewing his pieces, they are now enriched by the art, artisans, and techniques he’s discovered in Nepal, Guatemala, Vietnam, and other locales. 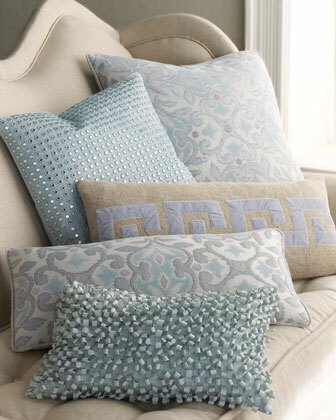 These pillows and gifts beautifully reflect that global influence. Available from One Kings Lane this coming month. 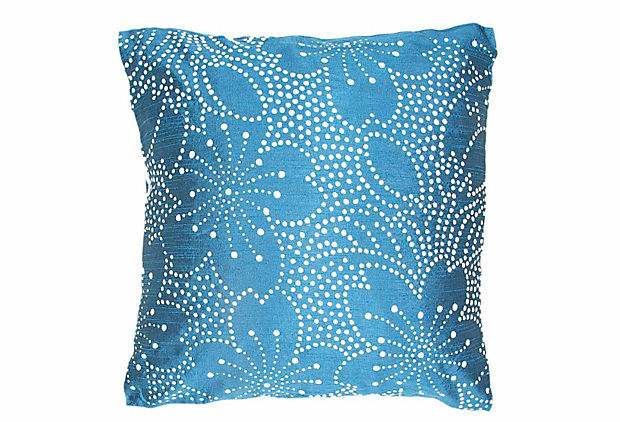 An Asian-inspired floral pattern graces this gorgeous cotton pillow in bright blue. With lush designs that range from traditional motifs to dynamic contemporary creations, Jaipur rugs, pillows, and poufs have the power to transform a room. Through the Jaipur Rugs Foundation, the company is also transforming the lives of its 40,000 weavers and other skilled artisans, working closely with the craftsmen’s disadvantaged communities to support women’s empowerment programs and provide greater access to healthcare and education.